Butter an 8x8-inch baking dish or spray it with nonstick cooking spray and set aside. Combine the sugar, milk, and butter in a medium sized boiler and cook on medium-low heat until the mixture comes to a boil. Be sure to stir frequently. Once it has reached the boiling point, boil for 5 minutes. Stir constantly. Seriously. Constantly. The mixture can scorch and you don't want that. You can even adjust the heat down some to maintain a boil without it scorching. Remove from the heat and stir in the chocolate chips and marshmallow creme. Stir until mixture is creamy and smooth. Add the chopped nuts (reserving a few to sprinkle on the top) and mix well. Cool completely and cut as desired. 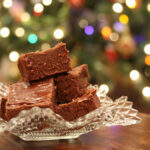 For even more flavor try toasting the nuts on the stovetop or in the oven before adding them to the fudge.